A new documentary about the fabled “Flatwoods Monster” has landed on streaming platforms and DVD. Did a UFO crash land in a rural West Virginia town in 1952? New eyewitness testimony obtained by a film production crew would seem to indicate it did. In a new documentary titled, The Flatwoods Monster: A Legacy of Fear, two of the only living witnesses to a strange, mechanical being exiting a bizarre craft will have the chance to tell their story. 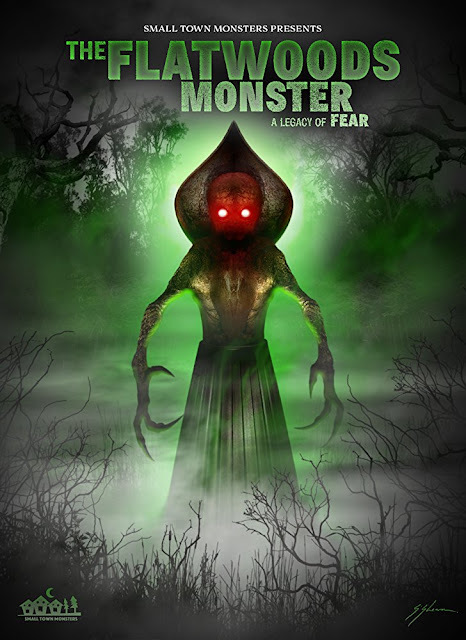 The Flatwoods Monster: A Legacy of Fear is a new documentary from director, Seth Breedlove (The Mothman of Point Pleasant) which will unlock a decades-old mystery that included a government-ordered military examination of a purported alien crash-site, and multiple UFOs seen by countless residents of Braxton County, WV. The film was at the center of a wildly successful crowdfunding campaign that earned over thirty six thousand dollars through Kickstarter and will see a wide streaming and DVD release by award-winning production company, Small Town Monsters. The Flatwoods Monster: A Legacy of Fear is now available on DVD and streaming on Amazon and Vimeo OnDemand with a wider digital release planned thereafter. Labels: Alien, Documentary, Flatwoods Monster, Seth Breedlove, Small Town Monsters, The Flatwoods Monster: A Legacy of Fear, U.F.O.